No event in the world comes close to matching the passion for the FIFA World Cup. Russia will be hosting the tournament this year, which will take place from June 14 to July 15. The World Cup is a time were all nations come together in unity through the love of football, with over three billion viewers expected to tune in for this year’s spectacle. Join the rest of the world and cheer on as the best players on the planet battle it out. The Socceroos fate of qualifying for the knockout stage will be determined by their results against Denmark and Peru to complete a strong Group C.
For those eager to cheer on from home, SBS will be broadcasting some of the World Cup games free to air. Fear not, ALL Socceroo games will be available via SBS, as well as a Match of the Day everyday and the tournament’s Semi-final and Final. Australia will begin their campaign against France at 8:00 pm on June 16, followed by Denmark at 10:00 pm on June 21 and finally Peru at 12:00 am on June 27. Optus Sport has exclusive rights to every World Cup game for this year’s tournament. This is not completely reserved for Optus customers only, with the service available for $14.99/month, with a cancellation available at any time. The Sports Bar at the Star Casino is considered football HQ for the 2018 World Cup. Located in Pyrmont, a vibrant atmosphere is expected all throughout the tournament, with giant screens displayed across the bar. The Sports Bar is open 24/7 so if your country is playing at 4:00 am, fear not. Cheers Bar is another sporting hub within the city, located along the busy George Street in Sydney’s centre. The atmosphere is always vibrant in the bar, and getting in early to guarantee a spot for the match is recommended as some passionate supporters will be calling this bar home for the World Cup. Be sure to be inside before 1:30am. The famous Coogee Bay Hotel will be hosting one of Sydney’s largest World Cup 2018 Fan Zones inside the renowned Selina’s Entertainment Centre. Games will be broadcast on a gigantic 250-inch projector inside Selina’s concert hall, which is completely dedicated to football this World Cup. The fan zone is spread over 2 levels, with two fully operational bars and a capacity of 1,700. Looking for something even bigger? The Enmore Theatre in Newtown will be showcasing all the Socceroos’ World Cup matches on their massive screen (9 x 6 metres), accompanied with a concert-quality sound system for a 4th consecutive World Cup, and it’s not hard to see why it has become such a popular spot to catch all the action. A bar will be in service at the Enmore, maximising supporter experience. Seating is provided in the theatre, with tickets priced at a reasonable $11 a head. For those looking for that World Cup experience north of the bridge, the Crowie will be showing all matches at this year’s tournament. Located in Crows Nest, the hotel is usually very busy on the weekends, so be sure to get in early and secure your spot for the match. The youngest player going to the World Cup at 19 years of age, Daniel Arzani is tipped for a very bright future in an Australian jersey. Arzani made only his first professional appearance for Melbourne City last year in the FFA Cup, and now he is posed to line-up against some of the world’s best. A graduate of the prestigious AIS centre of excellence, Arzani then moved to the Sydney FC academy, before finally joining Melbourne City. It was in Melbourne were Arzani’s talent started to become nationally recognised. Arzani is a player with incredible pace, willing to take a risk to create chances for those around him. After a very positive season with Melbourne City, Arzani has the potential to follow in the footsteps of such Australian legends as Tim Cahill and Harry Kewell. Undoubtedly Australia’s best player, Aaron Mooy embodies everything about what it means to wear the Green and Gold. Mooy oozes class, with fantastic ball control, vision and creativity. Australia’s go-to man will be at the heart of the socceroos’ midfield with the likes of Mile Jedinak and Tom Rogic, and don’t be surprised if he pops up with a goal. If Australia are to go far in the World Cup, it will most likely be due to the brilliance of Mooy. Mooy currently plays a vital role in the Premier League for Huddersfield Town, and will be key to Australia in this tournament. Coming into the tournament as one of the best and most sought after attackers in the world, Australia will have to be at their very best to successfully deal with Antoine Griezmann. The 27-year-old is in the form of his life for both club and country, scoring 30 goals and assisting 13 this season alone. The French wizard is lethal in front of goal, and is known for his dribbling and ability to find space in behind the defence. The less time Griezmann sees the ball for France, the more likely Australia are to get a positive result against the European juggernauts. It’s pretty simply for Australia; stop Christian Eriksen and stay in the game. The Dane is one of the best players in the Premier League for Tottenham Hotspur, and is cited for his clinical freekicks and long range. Some have tipped Eriksen to potentially be one of the players of the tournament. Australia’s job is to stifle Eriksen when in possession, as well as limiting all sights on goal from the Danish maestro. Peru are entering the World Cup with a subtle yet deserved confidence, with the team currently ranked 11th in the world. To put that into perspective, that’s higher than England, Italy and the Netherlands. Andre Carrillo has been a key component to Peru’s success, recognised for his ruthless attitude and lightning pace. Carrillo will most likely start playing in an attacking role on the right for Peru, leaving Australia’s left back at the time plenty to worry about. Considered by some to be one of the greatest, Lionel Messi certainly needs no justification as to why he is a potential golden boot winner. The 2018 World Cup could potentially be his last, providing extra motivation for goals, and the one trophy that is missing from his impressive cabinet. Messi is coming into the tournament in scintillating form having scored a mind boggling 54 goals for Barcelona last season. The newly promoted England captain will be looking to continue his fantastic goal scoring form seen with his current club, Tottenham Hotspur. Kane is prolific with both feet and in the air, making the Englishman a defenders nightmare. Kane scored 41 goals for Tottenham last season, demonstrating why he is a favourite to take home the golden boot at this years World Cup. The most expensive player of all time will be hoping to lead Brazil to World Cup glory, and pick up a golden boot along the way. Neymar’s presence in the tournament was under serious doubt after sustaining a serious foot injury earlier in the season for his club side, Paris Saint-Germain, but the Brazilian’s stature is so great that none of that may matter. At the age of only 26, Neymar has scored a total of 55 goals for Brazil, making him the country’s equal third highest goalscorer. Timo Werner may not be a household name like the other golden boot hopefuls, however Germany’s first-choice striker has just as much chance as anyone. Werner has explosive pace and will have plenty of opportunities front of goal with the likes of Mesut Ozil, Toni Kroos and Thomas Muller in support behind. Standing at 1.99m in height, the Chelsea goalkeeper will be one to look out for in Russia. Courtois will be hoping to replicate and improve on his performances from the 2014 World Cup in Brazil in which Belgium reached the quarterfinals. Courtois is regarded as one of the best goalkeepers in the world, cementing this position by winning both the Premier League title and golden gloves in the 2016/17 season. 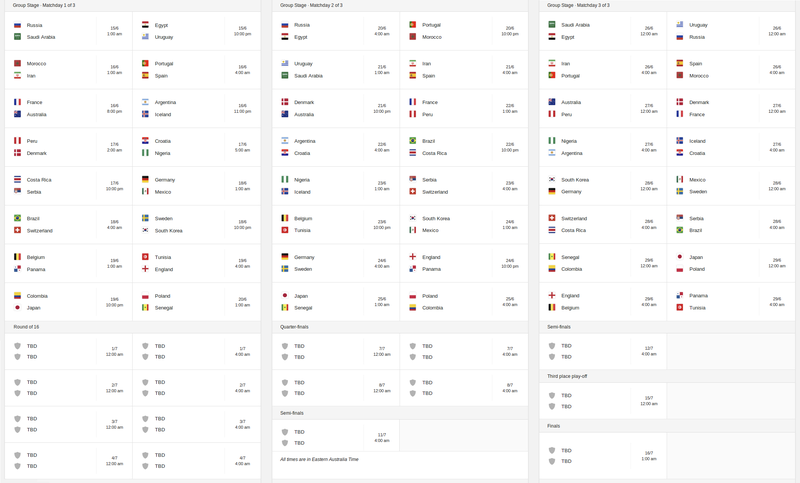 Sydney times for this years World Cup are spread across all different times, so make sure you don’t miss out and check out the full fixture list.